The Castle Arts Affair and More ends this weekend at the Arts Castle, 190 West Winter Street, Delaware. The Affair features the work of 60 artists with some demonstrating their individual techniques and concepts. 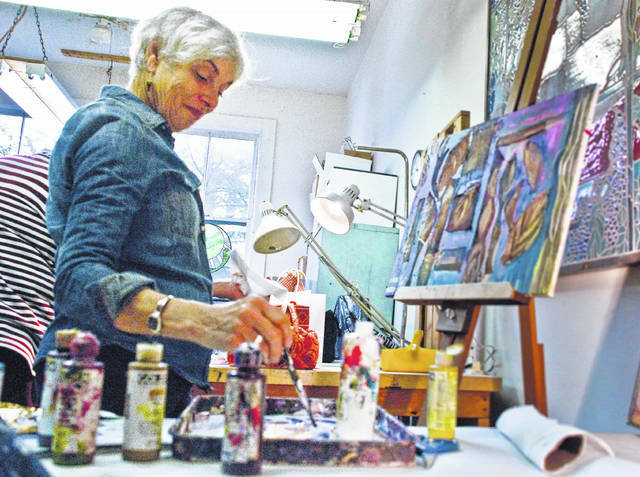 Dipping her brush to pick up more paint, Lynda Elias uses mixed media, a combination of paint, sand, and metal to create her one of a kind piece. The Castle Arts Affair is open from noon to 5 p.m. Saturday and noon to 4 p.m. Sunday. For information, go to artscastle.org.